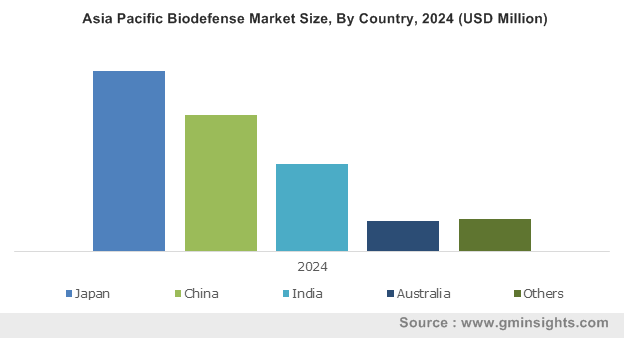 Biodefense Market size was valued at USD 12.2 billion in 2017 and is expected to witness 6.8% CAGR from 2018 to 2024. Growing awareness regarding bioterrorism attacks in developed countries such as the U.S. and Germany will significantly boost the market growth over forthcoming years. Bioterrorism attacks are intentional release of bacteria, viruses and other harmful microbes that are capable of spreading epidemics leading to deaths. This situation adversely impacts the economy as it affects the human health and leads to depletion of human resource. Hence, government in developed countries undertakes several initiatives as well as preventive measures to survive these attacks. Government usually stocks vaccines and biothreat detection devices to ensure maximum security of the population. Such government initiatives will boost the market growth. Increasing technological advancements will have positive impact on the industry growth during the analysis period. Due to growing bioterrorism activities, key industry players have added innovations in the biothreat detection devices that help in efficient of bacteria and viruses. Availability of technologically advanced biothreat detection devices will ensure safety and security of the population that will augment the industry growth. 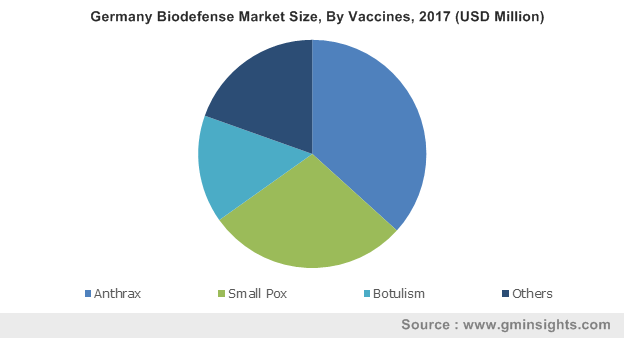 However, low R&D funding for manufacturing vaccines against bioterrorism attacks by government in developing and underdeveloped countries will hamper the market growth up to some extent. Vaccines segment was valued at USD 7.8 billion in 2017 and significant revenue size can be associated with increasing expenditures in R&D by pharmaceutical and biopharmaceutical companies. Currently, researchers are exploring new vaccine technologies that includes vector technology to induce rapid protection against pathogen attack. Recently developed vaccines have flexibility to address various bioterrorism agents and possess ability to generate a long-lasting immune response after a single oral dose. Development of such efficient vaccines will foster segmental growth. Bio-threat detection devices segment will experience 6.6% CAGR during the forecast timeframe. Key industry players operational in biodefense industry have developed portable detectors. Furthermore, Defense Advanced Research Project Agency (DARPA) has provided funding for a portable bio-threat detection device that is capable of analyzing DNA from a sample to efficiently detect the presence of infectious, bacterial or fungal agent within a short time span. Growing adoption of rapid biothreat detection systems will trigger segment growth. U.S. market will experience 6.5% CAGR throughout the forecast period and is expected to grow substantially. U.S. government implements several initiatives that helps them in strengthening security against bioterrorism attacks. Government plans several biodefense programs such as pandemic influenza and infectious disease program. Also, government initiates several programs focused on preparedness and prevention intentional or accidental releases of biological material will stimulate the U.S. biodefense market in forthcoming years. Japan market was valued at USD 931.8 million in 2017. 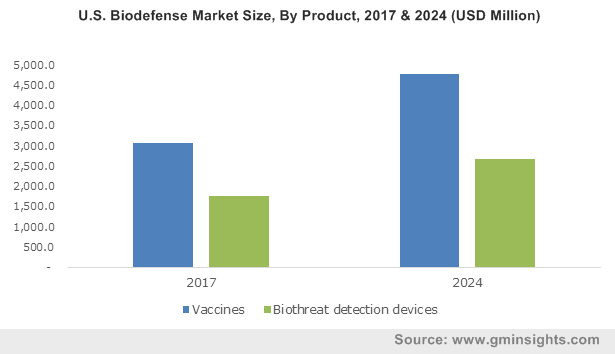 High awareness regarding availability of technologically advanced biothreat detection devices will surge the industry growth during the analysis timeframe. Furthermore, rising government initiatives and funding to prevent bioterrorism in Japan will positively influence the industry growth in foreseeable future. 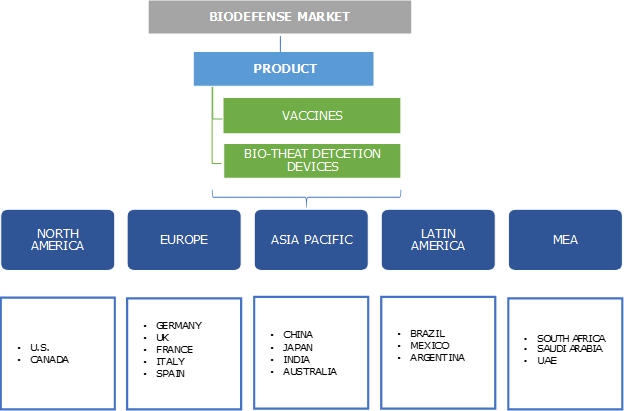 Eminent industry players operational in biodefense market includes Altimmune, Emergent BioSolutions, SIGA Technologies, Elusys Therapeutics, Ichor Medical Systems, DynPort Vaccine Company, Cleveland BioLabs, Bavarian Nordic, Achaogen, Alnylam Pharmaceuticals, PathSensors and BBI Detection. These key industry players implement strategic initiatives such as geographic expansions, new product launch and acquisitions to gain prominent market share. For instance, in January 2017, Altimmune and PharmAthenemer underwent merger to introduce next generation anthrax vaccine utilized in biodefense. This merger will prove beneficial for the growth of both the companies. Biodefense industry still in the development stage. Government in developed as well as developing countries undertakes various initiatives that ensures security of the population. The government plans programs that involves stocking of vaccines and biodefense machines utilized in case of sudden bioterrorism attack. For instance, Project Bioshield Act was signed in July 2004 to invest in procurement of vaccines and biothreat detection diseases. Biodefense industry will experience lucrative growth opportunities if the government takes frequent preventive measures to assure safety of population and the economy.